I can't believe how fast time is flying! This week of work was great. I'm still building up my confidence with the patients, but it is getting better everyday. I love talking to the people and listening to their stories. Gary the fireman is doing very well and feeling a lot better. My favorite patients this week range from a little old lady who is about 4' 10" and has one of the best smiles I have ever seen to a man who got injured because he is a legit bouncer and was breaking up a club fight. We get quite the range here on Long Island and every person is interesting and has a story to tell. One lady this week is 92 and was telling us about how she used to ride the bus to Coney Island and get a hot dog for 5¢. She is one of those people that you could listen to for hours. It is a small temple, but really beautiful. I spent today on the mid east side of the Manhattan and my first stop was SPRINKLES, the original cupcake shop. If you have ever watched Cupcake Wars on the food network, you know what I'm talking about. Sprinkles started in LA and I have been waiting for this shop to open for a while now! I would have to say it was worth the wait. First of all, the staff was SO NICE!!! I got an almond dark chocolate cupcake and milk for $5.50, which I thought was a good price for the city. I sat in the little shop on a window bench seat and ate my cupcake with the cute little wooden fork they provided. It was the perfect moistness and density of cake and the perfect amount of frosting. Next time you are in California, Dallas, Chicago, Houston, DC, or even Scottsdale (sort of random), I suggest you stop by. Another one of my activities today was going to the Stephen A Schwarzman Building, which is the main building for the NY Public Library system. It is beautiful and I enjoyed the visit, but the number of books is surprisingly small. This building is used more for research and conferences and such. There is a beautiful reading room with amazing ceilings. The outside of the library is the best part. There is a nice park and cute little chairs and tables where you can enjoy a great view of 5th Ave. 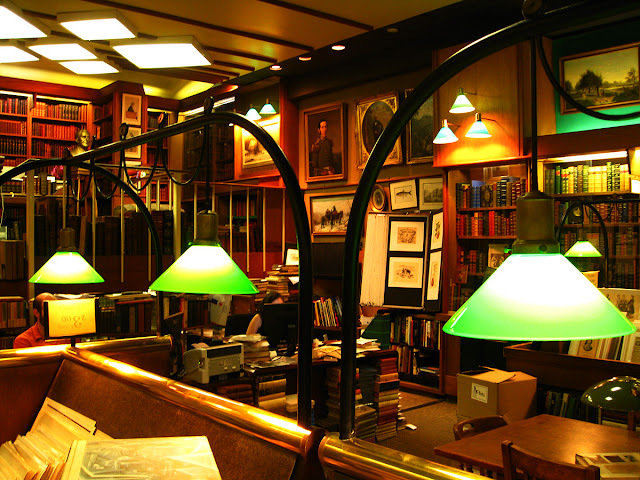 If it is books you are interested in, I suggest Argosy Books at 116 E 59th Street. It is 6 floors of old and rare books, autographs, and vintage maps and prints. AND they let you touch everything. I found some great vintage botanical prints fro $3 and $10 and some cool old book covers for $3. Not too shabby. The rest of the day I spent shopping in the fashion district. My crafty heart cannot resist the walls of ribbon and buttons and beads and fabrics in every store. I also stopped by Macy's on 34th. It is HUGE!!! I wanted to look for a cheetah print scarf and instead of 2 or 3, I found about 30! Maybe that's why it's the biggest store in the world? So much fun!!! I am so jealous of your funtime adventure times and wish I could be magically transported there to explore the city with you!! I want to email that book store and ask them to send me their conservation-requiring prints and things that are like anywhere under $30. Maybe eventually I will get brave enough to do that!! Katy, they seem like the type of place that would be all over that. They are family operated and I overheard them talking to this one guy for like 20 minutes to help him find something. Good luck!